Did you go to the Farmer’s Market? Don’t know what to make? 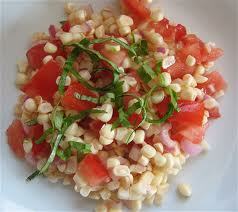 Well, it’s time for Corn and Tomato Salad! In the dog days of summer, I rely on the farmer’s market to feed us simply because I sort of cannot be bothered turning on the oven, especially the last month or so. I’ve been making this recipe for years, but recently added in the cheese twist as an homage to one of my fave restaurants, Frankie’s Spuntino, in Brooklyn. Hint: getting the corn off the cob is way easier with a corn stripper – you can find them at Sur La Table. 1/2 cup your choice: ricotta salata, boconcini, burrata, goat cheese, feta – crumbled, diced, whatever! Prepare an ice water bath by filling a large bowl halfway with ice and water; set aside. Bring a large pot of heavily salted water to a boil over high heat. Add corn kernels and cook until tender, about 4 minutes. Drain and place in the ice water bath until cool, about 4 minutes. Combine lemon juice,red wine vinegar, salt, and pepper in a large nonreactive bowl. While continuously whisking, add oil in a steady stream until completely incorporated. Add remaining ingredients (except cheese) and cooled corn and toss until well coated. Top with cheese of your choice. Serve. This dish tastes best at room temperature – you can also make a day ahead and add the cheese while you are serving. Just remember to take it out of the fridge and let it come to room temp! Posted in food, summer and tagged Frankie's Spuntino, Recipes, summer parties. Bookmark the permalink. Reader ideas welcome! Martha Stewart Living XM/Sirius Radio Show! I am lucky enough to have been invited by my dear friend Jayne, a completely gorgeous force of nature and fashion, to be a guest on the Martha Stewart Living Radio’s satellite morning show on XM/Sirius at 8 am on September 2. Mark your calendars! I’ll be talking about throwing the last great party of the summer – whether big or small, a clambake or a luau, a simple farmer’s market feast or a beach party. I’ve outlined my ideas, but it came to me that YOU should have some input as to what ideas you want to hear about hosting an end of summer party. So comment here with food, decor, invitation, favor, playlist and detail suggestions. We’d love to hear them. I will be sharing all the recipes that I discuss on the show here and on the martha blog. Posted in Uncategorized and tagged dolce in the media, Martha, radio, reader input, summer parties. Bookmark the permalink.